Fake it! How to make windows look bigger. Whether you are a weekend DIY warrior or a design professional, you know that sometimes the secret is just to fake it till you make it. Making windows look bigger is no exception. Big beautiful, well dressed windows are often the secret to a beautiful space, and they can even add value to a home for sale. If you are faced with awkwardly placed or small windows, try these tips by Ty Pennington. Please do try to learn to use an electric screwdriver a little better than Tim Gunn though, or you may still need to hire a professional. =0. 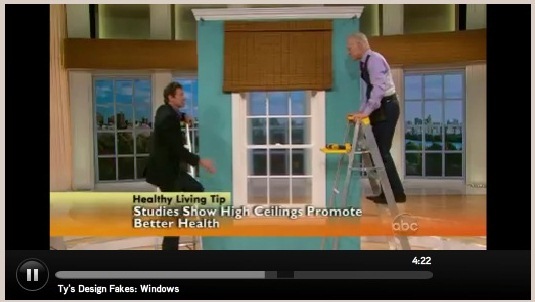 Simply by adding matchstick blinds or roman shades high to the ceiling the window appears larger. Completing the look with curtains from ceiling to floor, pulled back just slightly, creates a dramatic space anyone would love. Best of all, if your home is for sale, you may have just added instant equity. Hang your curtains wide and to the floor. This will continue the illusion of taller ceilings and bigger windows. I apologize for the video no longer being here, ABC’s Revolution was cancelled and all of their videos deleted. « A french cleat can make hanging DIY headboards easy.